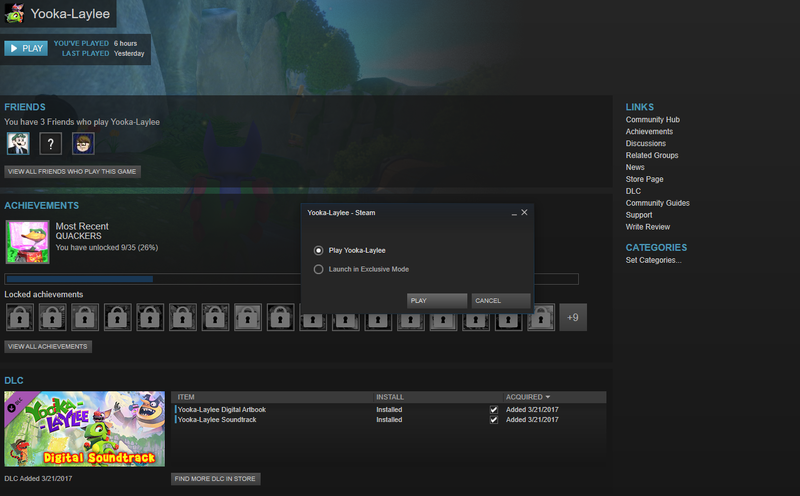 When you load up Yooka-Laylee on PC, the game will give you two different play options, one of which being Exclusive Mode. If you’re like us and wanted to look up what Exclusive Mode was before loading into it, no worries, we’ve got the full rundown for you. Before we dive into the details of Exclusive Mode, however, it’s important to note that this isn’t a feature only available to Kickstarter backers. Everyone has access to Exclusive Mode in Yooka-Laylee. With that out of the way, read on to find out what Exclusive Mode is in Yooka-Laylee! Yooka-Laylee will ask if you want to launch in Exclusive Mode when booting up the game. In Yooka-Laylee, Exclusive Mode is a version of Yooka-Laylee that will fullscreen the game and can help boost framerates. Essentially, it gives the game permission to take over your screen’s output and prioritize the application on your PC. To strip it down even further, Exclusive Mode will load Yooka-Laylee in fullscreen, while the standard mode is akin to playing Yooka-Laylee in a windowed mode (which can use up more of your system’s resources). If you’ve been having FPS issues while playing Yooka-Laylee, opting to play in Exclusive Mode can help smooth things out. Although, it’s important to remember that if you’re playing Yooka-Laylee on an older system, you may still have issues when running the game on max settings. To find out whether you should run in Exclusive Mode, be sure to take a quick peek at our guide on minimum PC requirements for Yooka-Laylee. If your computer is closer to the minimum PC requirements, you may find the game performs better in Exclusive Mode. Aside from your PC specs, Exclusive Mode may also run better for users with a single monitor, rather than a dual or tri-monitor setup (according to community feedback). If you find your system hiccuping and responding poorly to Yooka-Laylee’s Exclusive Mode (or in general), you can try to give the process more breathing room. As long as you have enough computer know-how, of course. Closing processes you're not using, like Chrome, can help improve performance. 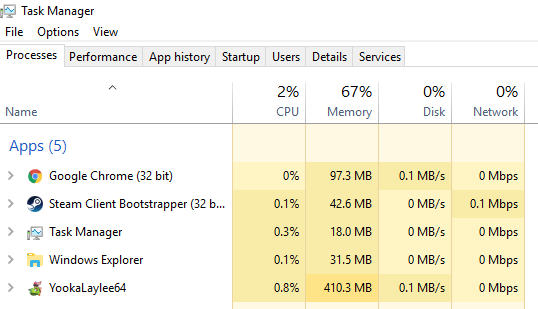 If your system is having a hard time running Yooka-Laylee, feel free to open up your Task Manager and shut down any unnecessary processes that may be overloading your computer’s memory, CPU, and/or disk space. For example, Skype or Google Chrome. Note that it’s always a good rule of thumb to avoid meddling with processes whose names you’re unfamiliar with. For additional information on the subject, be sure to check out this feature on processes that are safe to shut down. In the end, whether or not you choose to play Yooka-Laylee in Exclusive Mode will depend on your personal preferences and system specs. If you have optimal PC specs, you’ll likely experience no issues running the game normally in its native windowed mode. However, if you want to really improve the game’s FPS, run the game with less impact while streaming, or smooth out any issues your PC may have, be sure to opt for Exclusive Mode when playing Yooka-Laylee. By reading through this overview, you should know now what Exclusive Mode is in Yooka-Laylee.